Eclectic Educating: Hosting a Parent Night! Last week, my fellow reading specialist and I hosted a parent night at school to educate parents about how to help their child with reading and writing at home. With the cold weather, turnout was not as high as expected, but I really think the parents enjoyed the presentation. I saw a lot of head nods, which is encouraging! Above is a small preview of the Prezi we used for our presentation. To have the actual presentation click here. For the presentation, we used these great handouts from Primary Junction. They provide useful tips to parents for helping their child at home with reading and writing. If you would like a copy of her wonderful product, click here. We tried to keep the presentation simple and really wanted to drive home the point that you just need to read with your child. Don't make it extra school work and ruin their love of reading. While we knew we could stand up and talk about it all day, the best way to learn something is to see it! We found these awesome videos from Scholastic to show. I particularly enjoy the video of reading with the pre-teen. It is different from what most people of think of when they think of reading to their child. I think this video in particular inspired many parents. We also showed the graphic above to really show the difference reading at home with your child makes. It is quite astounding how quickly it all adds up! To help bring out the parents, we also provided free daycare by the high school National Honor Society and lots of free books to help prepare parents with the right materials to read with their child! How do you help educate parents about how to help their children? We host a family math night every year and each year the turnout gets better and better. We are currently around 85%. It really helps parents understand how learning math now is different than when they were in school. 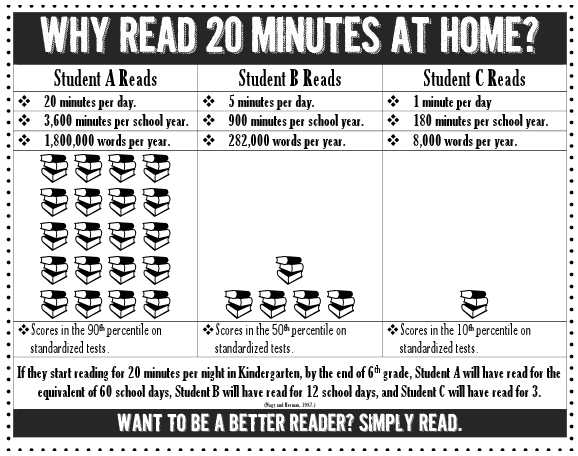 Love the videos and the graphic that shows how much reading at home adds up over time. This is a fabulous idea! I only wish the parents that needed these things the most would actually attend! Wow!! It looks like you put on a great presentation. We are trying to figure out a literacy night for our families and this is something I will definitely bookmark. Plus I'll call you to pick your brain! This is a great blog post! Very informative with great handout resources! Thanks for sharing! Thanks for sharing these videos. I'm going to put them on my class blog for my parents.